Tom King and Clay Mann’s hotly debated DC Comics event series Heroes in Crisis deliver its third issue to stands today, although Mann draws just two pages, leaving the bulk of the issue to King’s recent Batman collaborator Lee Weeks. Unlike the preceding issue, which hinted heavily at a casualty we’ll mention below but had no on-panel demises, Heroes in Crisis #3 flashes back to the massacre, confirming two previously unknown deaths, and strongly suggesting a whole bunch more. If you somehow missed all the hubbub, Heroes in Crisis revolves around a mass murder at the Sanctuary, a mental health facility founded by Superman, Batman and Wonder Woman to care for the specific trauma needs of the super-powered community. 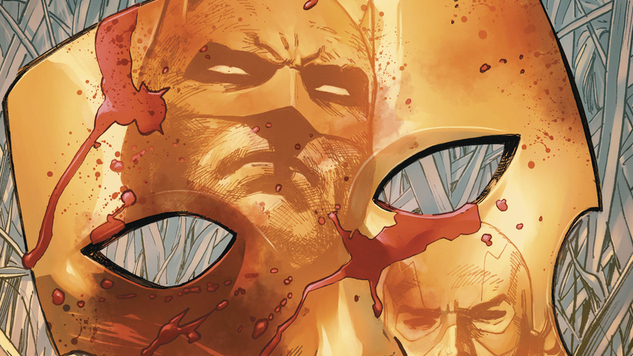 Sanctuary was briefly mentioned in King’s Batman run, but Heroes in Crisis #1 was its first official appearance, and readers discovered the facility littered with the bodies of its costumed patients. If you’d like to know more about the book’s uncertain tone—and who perishes in the first issue—check out the breakdown we ran back in September. For a rundown of which characters meet their untimely fate in Heroes in Crisis #3 (and how likely they are to stay dead), scroll on down. And we really shouldn’t have to explicitly state this, but Massive Spoilers Ahead. Don’t say we didn’t warn you. “Lagoon Boy has such a great design, DC Comics should do more with him,” an innocent Young Justice viewer said aloud, unknowingly causing a desiccated finger on Tom King’s monkey’s paw to bend and crack. Heroes in Crisis #3 is split between three flashbacks of different heroes processing their trauma, and Lagoon Boy’s might be the most upsetting. We won’t spoil it here, but we found it kind of funny, we found it kind of sad, the story in which Lagoon Boy died might be the best he ever had (or at least the most attention he ever got on the printed page, anyway). Latter-day teen heroes are at particular risk of becoming cannon fodder during event series—just ask dozens and dozens of dead X-Men cadets, or Hotspot, confirmed dead in Heroes in Crisis #1 and seen again here. Red Devil is probably chilling down in Hell forever more, seeing as how his mentor, Blue Devil, barely gets any page time himself (props to Blue Devil’s new Frazetta-esque reimagining in Justice League Dark, though). Red Devil was a fun addition to the Teen Titans dynamic during his pre-New 52 tenure, but he hails from a legacy-friendly era that sees little love at DC these days, and it’s unlikely he’ll be back. Gunfire, meanwhile, is a joke…which means there’s actually an outside chance some too-clever writer brings him back down the line. A spawn of the abortive Bloodlines event from the early ‘90s, Gunfire can “agitate particles” to make objects explode or shoot energy projectiles—a.k.a. Gambit without the sleazy charm or playing-card shtick. Gunfire is probably best known for his mocking appearance in Garth Ennis and John McCrea’s Hitman series, and odds are that will remain his only moment of “glory” regardless of whether or not he stays dead. Sorry, HiC creative team, we’re going to spoil the final page here: issue #3 ends with a nine-panel grid of Sanctuary patients talking to their robotic therapist (and, by extension, the reader). We know for sure that Commander Steel, Gunfire and Red Devil are victims of the attack, which bodes poorly for Tattooed Man, Gnarrk, Protector, Solstice and Nemesis, as well as Poison Ivy, easily the heaviest hitter on the page, whose death was strongly suggested by Harley Quinn’s dialogue in Heroes in Crisis #2. Two of these names stick out as poor candidates for perma-death, so here’s a brief rundown of the deceased who are likely to stay six feet under: this Tattooed Man is a tattoo-powered 2006 reinvention of an older Green Lantern foe, and had a decent run as a reluctant hero around the time of Final Crisis; Gnarrk is a deep-cut Teen Titans character who has the dubious distinction of being “the last Cro-Magnon”; The Protector is an honorary Teen Titan who was created for a drug-awareness special; and Solstice is one of the DCU’s few Indian heroes, introduced alongside Skitter as brand-new Teen Titans during the New 52 era. See what we said about teen heroes being at increased risk of event death? Nemesis has been the alter ego of several DC Comics characters, most prominently Tom Tresser. The Nemesis seen here certainly looks like Tresser, but he declines to provide a real name, and previous iterations have done the Mission Impossible face reveal to surprising effect. It wouldn’t be a shock for Tresser to end his secret-agent days at the Sanctuary, but the subterfuge potential and flexibility of the spy codename means DC will almost definitely eventually resurrect the Nemesis concept and suave turtleneck costume. The only shocking thing King and his collaborators could reveal about Poison Ivy at this point is that she isn’t dead. Her appearance on the doomed nine-panel grid aside, Harley’s motivation in Heroes in Crisis #2 seems entirely driven by the loss of her non-monogamous, toxin-tongued true love. King has been (forgive us) planting the seeds of Ivy’s death since he sent her off to the Sanctuary midway through his Batman run, and her name would help add heft to the collection of otherwise easily forgotten characters. That said, Ivy is a gold-standard Bat-character who has (we’re really sorry) branched off into popular supporting roles in books like Birds of Prey and Harley Quinn. Even if Ivy has been pruned, her plant-based powers give creators fertile ground to have her bloom again next season (we’re not actually sorry). Less Dead Than We Thought? When Wally West was nonchalantly counted among the dead in Heroes in Crisis #1, our eyebrows cocked up faster than a Flash Fact. Could one of DC’s all-time greats meet such an ignoble end? Would another Flash really be sacrificed on the cursed altar of event comics? Wally is, along with Lagoon Boy and current fugitive Booster Gold, one of the three spotlight heroes of Heroes in Crisis #3, but his simulated trauma therapy is more about immersing himself in a reassuring fiction than addressing his problems head-on. Once the deaths start piling up this issue, we see Wally cradling the lifeless body of his former teammate Arsenal, whispering half-sentences before getting bonked in the head by Harley Quinn’s oversized mallet, which means his fate may be less fatal than it seemed. We don’t want to speculate too wildly, but keep an eye on the Scarlet Speedster as Heroes in Crisis mournfully marches on.